ComfortFlex fit with tighter knitting in the front and ultra stretch in back. 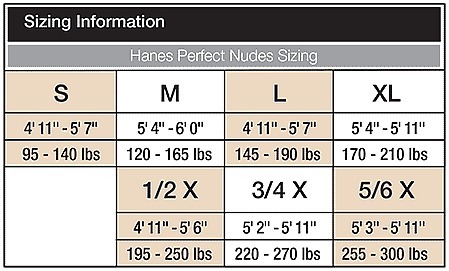 Hanes Perfect Nudes revolutionize perfect match sheer hosiery. Foundation Finish For Your Legs Wicking Cool Comfort from waist to toe, flat toe seam virtually disappears. Super lightweight sheers in natural skintone shades for an airbrushed appearance. Blends away imperfections so legs look smoother, sleeker and younger. Sheer to waist with light tummy control, updated modern rise, and super stretchy waistband. Lightweight yarns provide improved durability and resistance to runs.